Order Brewferm Wheat Beer Kit from the Stirling Homebrew Shop UK. 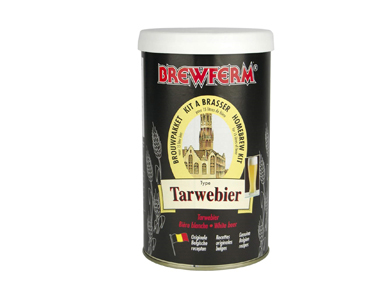 Buy Brewferm Tarwe Wheat Beer Kit - makes 12 litres and other Beer Kits & Cider Kits safely online in the UK. Tarwebier, wheat beer, is an almost white coloured beer, slightly cloudy, pleasant taste, aromatic nose and a real thirst quencher. Brewferm beer kits are Belgian beer kits made with the best hops and finest malts. All beer kits include instructions and chemicals needed. You will need to add sugar and water. Our UK Homebrew Shop sells real Brewferm and other Beer Kits & Cider Kits safely online to customers throughout the United Kingdom in England, Wales, Scotland and Northern-Ireland. View more products on the Stirling Homebrew Shop from Brewferm. Where to buy Brewferm Wheat Beer Kit safely online? Shop at the Stirling Homebrew Shop if you are wondering where you can buy Brewferm Tarwe Wheat Beer Kit - makes 12 litres safely online in the United Kingdom. Brewferm Wheat Beer Kit - Brewferm Tarwe Wheat Beer Kit - makes 12 litres in Beer Kits & Cider Kits and Homebrew.